Maintaining fish ponds and lakes during winter for improved water quality and fish survival. I don't know how many times I've helped someone set up an aeration system and when I finish sinking the last diffuser and the bubbles are rippling their glorious boil on the surface my client, bless his heart, will ask me if that's all their is to it! Let's back up the koi train a few stops! An aeration system is something that most anyone who venture into the project of building a pond understands is extremely important and key element in but so many people think the movement of water as circulation and the bubbler aerator system is something that is required in summer only! 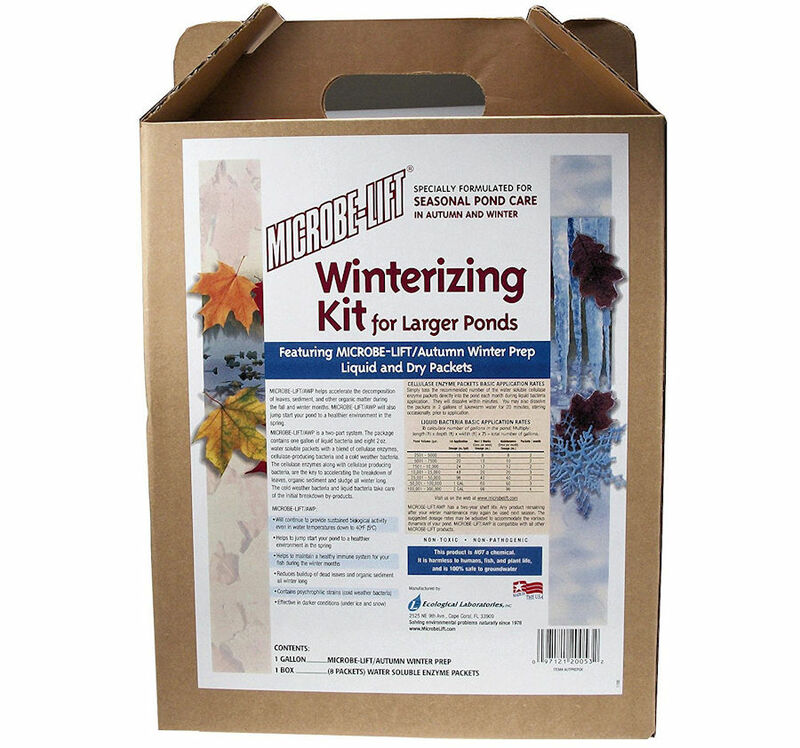 Winter pond care is a whole new dimension for many people who would like to think that when the snow and freezing temperatures lock their ponds and lakes in to a frozen block that all they need to worry about is the sharpness of their ice-skates and how to build a homemade zamboni! Of course aeration and circulation is critical in summer when the transfer of oxygen is so high and the stratification of temperature and elemental layers of the pond are their most severe. But what happens when the winter comes is that the surface freezes and the oxygen can't be absorbed by the water as readily when the surface is in a liquid state. Ice forms a hermetically sealed cover over a lake and just like wrapping a good sandwich in saran wrap it can preserve what's inside but it can also create conditions that lead to health problems...for the pond and the hero submarine! The ice can cause the fish; Koi fish, trout , carp or catfish, to be deprived of oxygen but even worse, the ice can cause trapped gasses to be held inside the pond. Imagine breathing into a plastic bag! The life giving sustenance of the pond under closed ice is lessened and the fish soon become lethargic, and die. Winter fish kills can be a catastrophic loss for a pond owner or aquaculturealist. Beyond the fish, a pond without a proper bubbler or de-icer hole accumulations of organic waste from falling debris such as leaves and nutrient runoff from gardens and nearby fertilization sources and the buildup can create putrid gasses that collect on the pond floor and create issues of algae growth and odors in the Spring. Another reason to add a deicer or pond heater to a pond. When you want to aerate a pond you are usually looking at the needs of a pond during the warm pond season which is usually from April through October in North America and of course, as I've been told, quite different in the Southern Hemisphere...when I was in Australia in January I saw some wonderful ponds and in December in Hawaii they showed off some of the most incredible flowering koi ponds I have ever seen. The chemical reactions and biological needs of a pond in winter are about 20 percent less than what would be required in a fully operational summer pond or lake. If you operate, for example, a summer pond or lake circulator with 4 diffusers being fed by an air pump, shore mounted, delivering say 10 CFM at a pressure of 5PSI to 10 PSI then you would need only one diffuser and maybe 2 CFM during winter to ensure that there was no buildup of nitrites, ammonia, or other complicating elements. 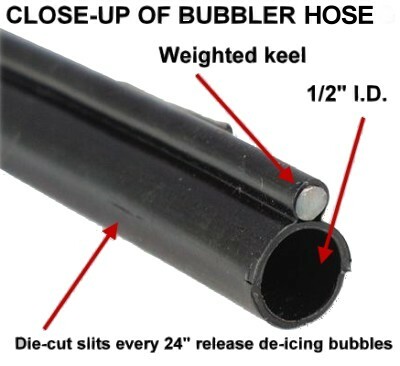 If your pond is in an area where a wide gaping hole in the ice is acceptable and will not be a danger to migrating deer, snowmobiles, cross-country-skiers on your pond, animal or pet trail migrations or figure skating children or relatives who enjoy hockey on the pond then you can consider a simple and cheap bubbler type of de-icer. In smaller ponds when there is an an electrical outlet near the shore, preferably mounted on a post, you can plug in an electric de-icer. In larger ponds it is often easier to buy a system that has a long-lasting oil-free compressor that can deliver the appropriate cubic feet per minute of air to the diffuser (usually about 1 to 4 CFM) which will mean a single self-sinking diffuser causing bubbles to maintain a hole in the ice. Believe it or not but it is not desirable to open too large of a hole in the pond as this can result in the super-cooling or overcooling of a pond which means that the movement of the pond is so great that the water is losing all it's heat through contact with the cold atmosphere and can literally turn to a slushy coagulated mess killing fish and causing more damage than good...well maybe that's a bit dramatic but still! The frozen winter season can be tough on a prized koi or goldfish pond, and it is essential to start preparing for winter a couple of months in advance which usually means you have to think about the BactaPUR Pond treatment which is a cold water bacteria in about August if you live in Canada and maybe October if your pond is below of the 49th parallel!  Change your fish feed to one with less percentage of protein and higher levels of carbohydrates. This will help increase their fat reserves, which will give them more energy over Winter. If the water temperature drops below 10 Celsius, stop feeding them altogether. Remember the fish metabolism slows to a turtles pace in winter so they don't need the regular growth inducing levels of feed bringing them to the surface with their puckered mouths gaping for handouts!  Clean the pond. A lined pond or a pre-formed pond should have regular muck removal or vacuuming via a pond suction device which will skim and remove the thick organic material from the bottom of the pond that clings to the pond rocks and walls (the mucky stuff in the pond includes dead plant material and goldfish droppings). If it is humanly possible it would be ideal to remove the fish from the pond, drain all the water, clean the bottom of the pond, and replace the fish in clean water. Make sure you don't set your prized Japanese Koi in a bucket near the kitchen or you may find someone has decided to make a "special fisherman's special" supper. Oh My!  In the pond... cut away dead or dying leaves on aquatic plants. Some shoreline plants and the invasive species may require more severe pruning, so get appropriate tools from us and use the best aquatic garden tools.  If your pond has leaves from surrounding trees falling into it, place a fine leaf-net over the surface of the water to catch falling leaves. This helps keep the leaves out of the pond which is best as the decomposing leaves remove oxygen which can reduce available oxygen for your fish!  Put a hiding place for the goldfish in the pond. Winter is hard on the birds and predators that eat fish too, and they will take an easy meal if it is available. . While some cheapskates use an upside-down flower pot as a fish protection device a more ecological choice would be a floating island or a floating islandscape which are plantable floating structures that can offer great protection for fish but without dumping homemade Styrofoam plastic homemade planters or pots to protect your fishy friends! Yep...just like the annual switching of the all-seasons to studded winter tires every single year, as summer ends and the weather gets colder and we head towards winter people come by my house and we sit by the pond having a last-minute bar-b-que under the crimson and orange leaves and as I hear the little voice in my head as do I really know how to how to prepare my ponds for winter? I mean, I've had the darned thing for fifteen years and what started out as a backyard hole with a pre-formed molded pond has turned into a series of waterfalls and ponds that are scattered near the large earth pond in what must look like crop-circles from the air and every November I see the plants going dormant, the irises and lilypads turning brown and warning me that it's time to get the winter pond checklist out of the closet! The entire pond including the fish and plants need their own special care and have very different needs in the winter which require you to ensure specific treatments. When the water temperature of the pond, try and measure the temperature not right near the surface or near the shore as it is always several degrees warmer that the deeper areas, is around 10 degrees Celsius or 50 degrees Fahrenheit you will start to see your fish start to lose interest in food and at this stage it is best to only feed them 2 or 3 times per week. When the temperature is around 41 degrees Fahrenheit or 5 degrees Celsius you should stop feeding them all-together. Goldfish and Koi as do not really not need to eat during the winter as their bodies metabolism slows down and their metabolic rate is reduced so it , it can actually be bad for them to be fed during these cold months! Even trout, carp, bass and other lake and large pond fish don't need to be fed anymore. I know most folks, unless they are real hard-core fisherman and use automatic feeders to keep their stock plump, don't feed most species but if you are feeding your stock it is best to reduce and then stop for winter. Fish health in their internal organs requires certain enzymes and bacteria in the digestive tract to break down the fish food properly and while these naturally secreted enzymes and bacteria flourish in the warm months, their levels quickly start to decrease when the pond water temperatures start to drop which means that food given in cold temperatures when these enzymes are not being produced can pass through the digestive tract completely undigested, and potentially cause dangerous blockages or even start to decay inside the core of the fish. So do your fish a favor and resist the urge to keep feeding them. I know how bad I felt when I ate too much of Rose's Super-Bowl Chili last January and was blocked up for a week! I'd hate my prized goldfish to live through such pain!! Now I'm not a maniac when it comes to fish, I have a few but that's not the raison d'être of my ponds. I have had some lessons in fish survival mostly learned the hard way when I've had fish kills or seen the ice melt and watch in sadness as there was no life left in the fish...for this reason I try and resist giving my fish names anymore...but I still do because my fish are like my pets! Now there are some wheat germ based fish foods and special spring and fall foods that are formulated for easy digestion to allow you to continue feeding later in to the fall and start spring feeding earlier but even these foods they should only be used in cooler water temperatures a couple times a week, and should also be stopped in water temperatures below 40 degrees F or 5 degrees C.
Weighted de-icer airhose/bubbler tube for deicing small and large areas. Weighted 1/2" I.D. tubing requires only 1 CFM per 100 feet (0.01 CFM per foot). Single runs of up to 200' can be used with even bubble flow. More info. Fish, like most of my family on my Papa's side, have plenty of fat stored up in their body from their summer-long feasting to last them through until Spring as long as the other important element in keeping the fish healthy over the winter is addressed and that is is to provide adequate gas exchange in the pond. This simply means providing an outlet for toxic gasses to escape through the ice as the organic pond debris like leaves and plants and fish waste starts to decompose. This also means allowing oxygen to enter the water for the fish. How can we perform all of these operations? Well...let me put it simple...you need to keep a hole in the ice! Yep; a bubbler, a pond heater, a running pump or a homemade lightbulb in a wooden box floating on air-filled floaters will do the trick but the key is to ensure a hole in the ice for gases to escape and oxygen to get to the fish. In shallow ponds the ice can get quite thick and if the pond freezes in to a solid mass it will be a disaster for the fish. Beyond giving your fish fresh air having a bubbler or an electric pond heater also allows an pond without fish to remain healthier. The decaying leaves upon decomposition release potentially toxic gases and unwanted elements into the pond; this can lead to that stinky sulfur smell and a buildup of black odorous muck. Having a chimney to vent out gases is a great way to keep things clean upon ice dispersion in Spring. 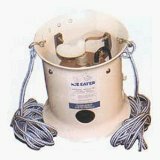 For smaller ponds a floating pond de-icer is a easy to install and cheap bubbler alternative. They usually have only 10 to 20 feet of power cord so they are used mainly in backyard ponds, patio ponds or in ponds where having a hole near the shore is adequate. They don't add any extra oxygen so it might be recommended to add a small aerator or bubbler in one area of the pond along with the pond heater or thermo-pond de-icer. Some pond owners like to leave their pumps and filter boxes running all winter, and while you may get away with this in southern states or in warmer winters but I recommend that the pump and filter be shut off in most cases mainly because if your submersible pump is at the deep end you will be cooling off those deep waters as the water is pumped towards the cold air and you can sometimes super-cool your pond to the point where it is only slightly above freezing and can turn into a veritable slushy inhospitable gel for your fish. The other reason I prefer to stop the filter and skimmer in winter is to do maintenance and clean all filters and ensure the circulation system will have a longer life. If the power goes out and your pump gets damaged or freeze and your filter stays uncleaned and gets clogged you might just end up burning out an expensive submersible pump. It is no fun to try and perform maintenance on a filter in the cold weather, so most people neglect cleaning the filter if they leave it operating from December through March and the filter will ultimately have a tendency to clog which will put an excess strain on your pump. Now even worse, in the case of one of those external pressurized biological filters, a power failure during a frigid period where temperatures are below freezing can cause the pump to stop and the filter to freeze and crack because it is full of water. That's a costly repair and a risk you shouldn't take! I leave the aquatic plants to my daughters who know more about identifying every pond species in our yard...I can spot the different colors but that's as far as my expertise on plants goes. Still, the girls tell me that preparing pond plants for winter isn't really as tough as I make it out to be. Some plants do not over winter at all and must be thrown out and these include most of the floating plants like water hyacinths, water lettuce, floating fern, and any other non-potted floating plants but even some potted plants like tropical water lilies must be tossed on to the compost heap of and replaced in the spring. Almost all potted plants do well and can survive over winter provided they are properly prepared which mainly means taking the time to trim down the plants as much as possible. This involves trimming or cutting all parts of your plant that grows up above the level of the rim of the pot. These extended parts of the plant if they are above the pot edge will only die and decay in the pond in the winter, so it is best just to trim it off. Any hearty roots or plant tubers, which are well insulated in the dirt, normally winter over and survive if they are kept below the frost level of the pond. For this reason, we also recommend lowering the pots down to the deepest part of the pond during the winter. When your roots are exposed to extreme cold, they will just die and need to be replaced, so if you want to keep them for next season they should be at least 18 inches or 45 centimeters below the water surface. Now guess what, adding that heater we talked about earlier is going to help! Another reason to spend a few centers per day in hydroelectric costs to keep those blooms blooming next April! I decided to keep my five prized goldfish outside over the winter instead of bringing them inside like we had originally planned. We thought the cost of buying an aquarium for the goldfish would be too expensive and thought that just keeping the goldfish outside in the pond would be better. We had bought a 100 Watt Pond Heater for the 125 gallon pond and a 100 watt heater for the other 85 gallon pond. These floating deicers worked great and we could see that there was open water in the small hole in the floating unit so we though everything was fine. One day we noticed the fish swimming near the surface, and this was after the weather had turned warm and all of the ice melted, so we wondered if they were ok. The fish were near the surface sort of swimming on their sides and really gasping for air but we didn't understand because normally cold water can hold so much more oxygen and we figured that since we were letting the gasses escape with the deicer that there wouldn't be any issues. We decided to take a precautionary check of the pond water, we have a small water testing kit, and were shocked to see the ammonia levels were through the roof up to around 9 ppm which was close to lethal for the poor fishes! We added a small bubbler aerator airstone into the pond and let it bubble up from the bottom and within a few days the water test showed less than 1 PPM of ammonia and the fish looked much healthier and were swimming so much more robustly! So even if you use a deicer make sure you add the occasional circulation with a bubbler to keep the stagnant waters in even a small pond from making the fish sick. The surface tension on the pond can trap ammonia, nitrites and nitrates as well and cause serious health issues. We now always combine a floating deicer with a bubbler that we use part time. I know, everyone tells me I often repeat myself but if you're like me you need to hear something a few times before it sinks in to the old cranium! So lets review what to do with pond plants: the plants you love and cherish and hate to see eaten by muskrats deer and puppies are the number one factor in creating decay in your pond and must be dealt with before or, in my case because I'm kind of lazy, right after the first frost. First I start with removing almost all foliage from your aquatic plants until they look like stubby little pathetic sticks...it's ok...I know they will be back with a vengeance in 5 months so am not worried! . Water lily leaves and any blooms should be clipped at the container level and composted. Once that is done, use gloves to prevent finger nicks, place your containers in the deepest area of your pond. All marginal plants we tend to clip 2" (5 cm) above the water line. I like to winterize these plants at the very last minute, in case the weather suddenly gets warm and their biological confusion causes the plants to actually start growing! Surface plants should be what? Yep...toss 'em because most are tropical and will not make it through the winter months in most planting zones. The submerged or oxygenating plants can last the entire winter if the pond is deep enough, the greater the depth the better their chances are. Before you go back inside to listen to your Johnny Cash records, oops, that's me only, you should remove as much foliage and debris from the pond so you have less work at startup in the Spring. 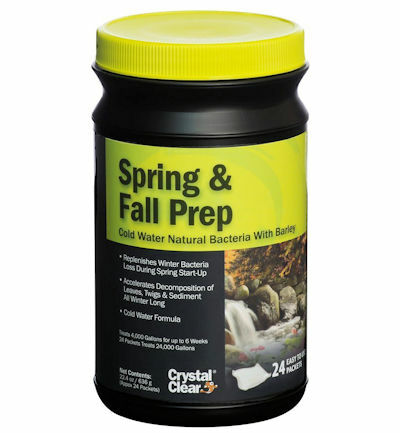 I always do an end of season beneficial bacteria treatment in my bigger ponds to keep the water clear; my favorite is nitrifying bacteria is what keeps the pond clean but this isn't so great in cold water so I use a good liquid bacteria like Bacta-PUR XLG or Microbe-Lift Autumn Winter Prep to that will continue providing sustained biological activity in water temperatures below 41 degrees (5C). This same liquid bacteria blend helps to jump-start your pond to a healthier environment in the spring and is totally safe for your friends the fish!. Of course using a liquid pond bacteria like Bacta_PUR XLG is an important key in reducing muck but by covering your pond with a leaf net you can further enhance chances of having crystal diamond waters in June! Covering your pond with the correct sized net, usually with squares that are 3/8" or 1/2" to stop most small debris should be done with care if using an electric pond heater. This best netting is strong and will never rot or decay and if it is UV resistant even better. , The netting is stretched tightly across the pond and anchored with stakes or rocks and one thing I do is place a floating beach ball or an object in the pond to make the netting like a tent instead of eventually sagging and lying in the water. You can also use foam, beach balls, even the blow up rubber toys used in pools. Either way, get the netting raised up above the surface. The new Perfect Climate line from K&H Manufacturing has reinvented the wheel when it comes to keeping ice free water available in winter ponds. Every K&H de-icer is safe in all ponds, unlike many of the other de-icers available in the market today. Every one of our de-icers can be used as a floating de-icer out of the box or in seconds converts to a submersible de-icer with the click of a button. In the past, all that was readily available were energy gulping 1000 watt to 1500 watt de-icers; pond owners had no choice but to purchase these expensive to run de-icers, even when they didn't need it. We solved this problem by creating a whole line of de-icers along with a convenient zone chart for consumers to choose the correct de-icer, every time. When it comes to ice free ponds, K&H Perfect Climate is the choice that makes cents. For ponds up to 1000 gallons. The world-foots most energy efficient pond heater. Thermo-Pond is a unique patented pond heater that keeps a hole through the ice in backyard ponds for just pennies a day. In fact, Thermo-Pond can save up to $30.00 a month in electricity VS. Those high wattage stock tank style de-icers. Just think, Thermo-Pond pays for itself in as little as 2 months. Thermo-Pond floats on top of the water and is thermostatically controlled to never get hot. Unlike some other heaters, Thermo-Pond will never burn a pond liner or plastic pond. It naturally allows the pond to ice over while maintaining a hole through the ice. Allowing that gas exchange can help keep a healthier environment during the winter months Thermo-Pond should be used in ponds that are deep enough to allow plenty of livable water under the iced portion of the pond. One year limited warranty.